With five exhibitions opening within a 100 mile radius of home, it became clear by last Friday afternoon that there were two previews that were within close enough proximity to be in the running for a rather fine early-evening drive in good spring weather. With Thurso Art Gallery opening the new season with the somewhat engagé Another Country, a swift drive along the Sutherland and Caithness coastline would have brought me far more quickly into contact with a politically relevant group show curated around the theme of migration, asylum and contemporary immigration to Scotland. I decided against it, however, and that was a good call as it turned out. Only later did I become aware that there was no preview for Another Country due to an installation that overran well into the late hours. 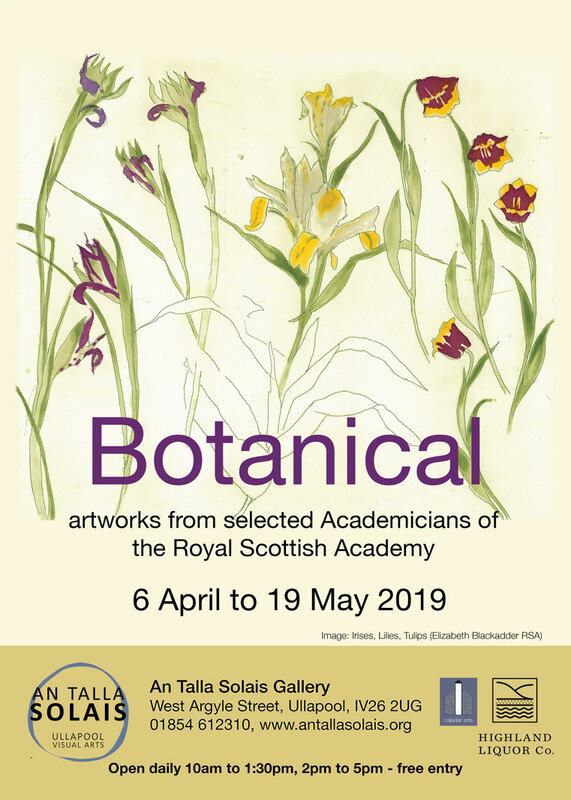 Lucky then, I guess, that I opted for An Talla Solais Gallery’s exhibition Botanical: Artworks from the Collection of the Royal Scottish Academy that opened in Ullapool. So, of what does it consist? As an exhibition taking the form of a collaborative venture with the RSA, the presentation of paintings, prints and sculptures that represent what is claimed to be “an investigation into the plant world” had (on paper, at least) all the hallmarks of a contrivance-too-far, and I certainly wasn’t sure that I would encounter anything quite so on the cusp of current political affairs as what Thurso Art Gallery had promised to offer. Preconceptions are clearly baggage best left at the gallery door, however, and there are certainly some welcome surprises here, albeit accompanied by the usual establishment suspects, too, treading the same water as ever. Long before this spring exhibition was conceived in collaboration with the RSA, it had already been doing the rounds in a different form under the title Winter Flowers. Reconfigured as a spring exhibition, one wonders what’s been written out of the previous format (if anything), but certainly it fits the season and seemed to meet with reasonable approval by those attending. As the RSA’s Director, Colin Greenslade states, “when developing the original exhibition Winter Flowers for the programme at the RSA in Edinburgh, we thought long and hard about representing the breadth of practice by Academicians from across Scotland. These artists’ fascination with the natural world, and their depiction and presentation of this research are small links in a long chain of connection and reinterpretation of our natural environment.” So far so good? As Greenslade promotes it, here are to be found “sensitive drawings, colour and monochrome prints and robust sculptures, all of which allow us to reflect upon our own relationship with plants, experiencing them and enjoying them in our parks, gardens, countryside and homes.” Put that way it does all begin to sound a little dull, I have to say, and even when the role of plants are cited for their properties as “medicine, food, drinks, textiles and many more everyday components of our daily lives,” he makes it sound no more enticing than a vase of jugged pansies. If these works have any potential to excite, as Greenslade suggests, it is less for the somewhat tenuous subject matter here, and more for the juxtaposition of handling in a variety of media across the show overall. Adrian Wiszniewski’s Crail - Scotland l offers the possibility of most surprise I think, juxtaposed as it is with a diptych titled Ex-Libris by Marion Smith as one enters the gallery. Wiszniewski’s Crail has a distinctly Art Nouveau-ish touch; even though the comparison may seem tenuous at first. A large-scale six colour woodblock print, Crail - Scotland l is vaguely reminiscent of fin de siècle Hungarian Art Nouveau most identified with József Rippl-Rónai and his contemporaries (in particular, Rippl-Rónai’s designs for ceramics that he produced for the Zsolnay factory in Pecs between 1872 and 1900). Marion Smith’s diptych, meanwhile, would not be out of place in some alcove or other in a house designed by, say, Otto Wagner during his early years – even more so her rectangular bronze plaques titled Imprint and Reader’s Fragment. There’s also a touch of Ian Hamilton Finlay’s best work about what Smith does, but without all the Saint-Just Vigilante posturing. The work of David Michie, I’ve never much had time for, it should be admitted, as there never seems to be a convincing consolidation of the two directions his work had a tendency to go in (overly laboured and turgid, particularly during the 1970s, or far too fiddly and self-conscious in execution at other times). A painter’s painter he may well have been, and highly respected for his contribution as an educator for all the right reasons, I still never find myself fully convinced by the work. The handling is far too tentative in My Heart is a Garden, for a start, as though a mid-career David Hockney is trying to channel a late-career Gillian Ayres, and the crass representation of a pink and red rose, centre-right, simply detracts from the repetitive smudges and daubs of the overall composition; an unwelcome and unnecessary nod to realism that really doesn't help the picture at all. The work of an artist I do have a great deal of respect for is that of Jennifer Mcrae, although again, the selection here, while subtle and delicately worked as studies, falls away into insignificance when compared to the botanical detail of her larger works and portraiture that is not exhibited in this modest selection. While her portraiture for which she is much-celebrated often reveals her subjects backgrounded at close quarter by floral or botanical wallpaper designs, paintings such as Hinterland (below) and her thoroughly contemporary Primavera show her botanical interests in their most rewarding context, in my opinion. Jennifer Mcrae, Hinterland, Oil on Linen (Not in Exhibition) © The Artist. With regard the hang of the exhibition, it is very well executed overall, given what An Talla Solais had to work with (the work included here is nothing if not diverse) but certainly the group exhibitions that the gallery has staged of late have been those that expose the subtle flaws of the space, too, and Botanical is no exception in this regard. Make no mistake; the space is wonderful for any exhibitor, and versatile, too, but it is surely due for a minor refit if only to employ a joiner to install skirting boards at floor level that are uniform in size. Why? Well, it is a subtle detail, as said, but important nonetheless – particularly when a seamless flow is desired as one passes from one work to another. While the footprint of the space works beautifully, it is these seemingly minor details that do require attention as An Talla Solais becomes an ongoing force on the West Coast; a venue deserving of attention for its growing program of ingenious exhibitions, and thematic shows. 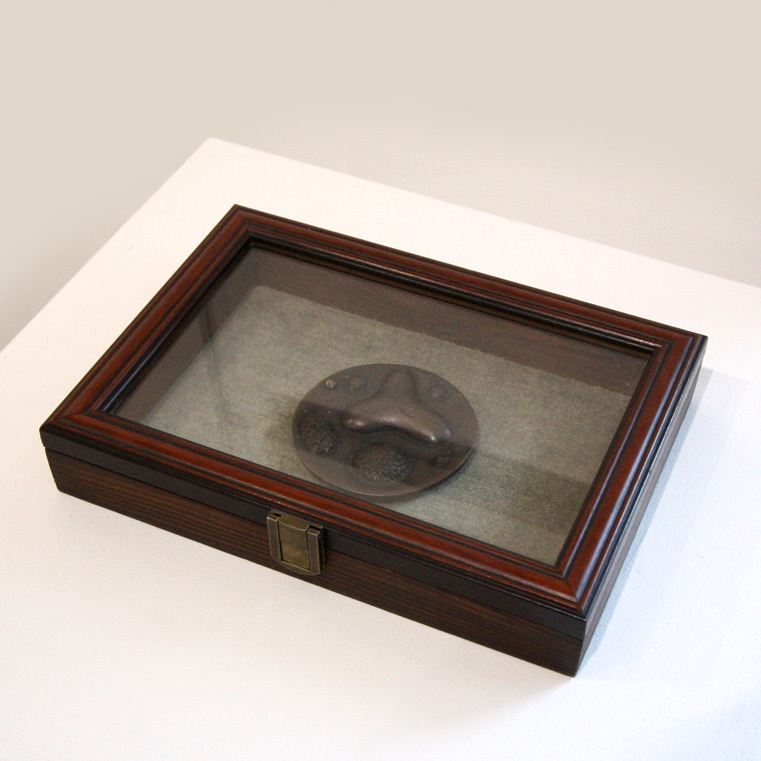 By far the biggest draw of the current exhibition are the works included by Marion Smith, already mentioned, including her limited-edition boxed and glazed medallion-like Pollen in bronze; a work that echoes the specimen cases of amateur botanists from the nineteenth century. Exquisitely executed to the highest standard, Pollen (a bronze edition of 7 in all) is a highly collectable piece that, in this selling exhibition, in my opinion is vastly underpriced at just £525. A young artist among her elders here (though certainly not the youngest, as far as I could discern) her work merits attention and, if the opportunity arose and the circumstances were right, it would be interesting to see what she would do with this space for a solo show (should it ever be the case that it could be arranged). If I am correct in my assumption, Pollen was originally a work cast in bronze as part of a series in 2014, each of which were discs inlaid into oak seating on the network of pathways around the Loch Leven heritage trail. Other artists exhibiting include, Ade Adesina, Alfons Bytautas, George Donald, Victoria Crowe, Graham Fagen, Derrick Guild, Elspeth Lamb, Kirkland Main, Anne Redpath, Geoffrey Squire, and Frances Walker, but of these, on the basis of what is exhibited here it is Ade Adesina who really merits a mention among the ‘also rans’. And then? Then there are the perennial favourites (not flowers, but certain artists, of course), of which Elizabeth Blackadder is the most notable here. Blackadder is probably the greatest pull for some, but the work she has on show in Botanical is by no means her best work for sure, and that choice must be laid clearly at the RSA’s door. Blackadder is safe but the standard is more variable than is often thought. The thinking seems to be that you always know what you are dealing with when it comes to Elizabeth Blackadder, but I’m not so sure. Blackadder was one of the first artists I ever had the pleasure to write about, some thirty years ago now in the pages of the journal Apollo, and it genuinely was a pleasure, but what I wrote back then probably still applies in the sense that, give or take the odd cat, she has not really moved on. Not that she should, of course – she does offer a certain sense of safety and calm for those who don’t cope with change easily. Although her work has undergone several phases of transformation since I first clapped eyes on it, the phases have been as subtle as her method, and it is no wonder that notelet and stationary manufacturers have found artists to mimic her stylistic hand, peddling lookalike lilies for nearly every card occasion. Certainly as stationary, notelets, or cards they could never offend recipients of a certain generation, and most major art museums in the UK do a roaring trade in a range of notebooks licensed for Blackadder’s own images, too, making her the ‘Dame of Merch’ for a multitude or maiden aunts. As an exhibition perhaps intended to get the gallery into its stride for 2019, Botanical does what it is supposed to, and it is clear that An Talla Solais has done its utmost to make the best of this bunch with some obvious thought given to hanging a sympathetic collection of hugely diverse work of variable quality. Following on from its members’ show at the end of last year, it has started with a different kind of members show, and several of those included here are not really deserving of being being viewed as the elite of Scottish art; certainly not on the basis of the work the RSA has placed on loan for the duration. Highlights remain in that single work by Wiszniewski, therefore; the inclusions from Marion Smith, too; and some subtle studies from Jennifer Mcrae that point to the strength of her wider practice. Finally, Ade Adesina’s monochrome works that are of a certain knowing quality, albeit not to my personal taste will appeal to many visitors. Fear not though, for the gallery has a sound programme to follow, with artists growing in stature and relevance as the year progresses. For now there are also some very reasonably priced gems hidden in the undergrowth of Botanical, even if it does take a little while to weed them out.